difference to a restaurant’s sales. altogether) dollar signs on the menu. The right menu design is critical. It’s the difference between confused customers and sporadic sales, versus customers ordering the dishes you prominently display. 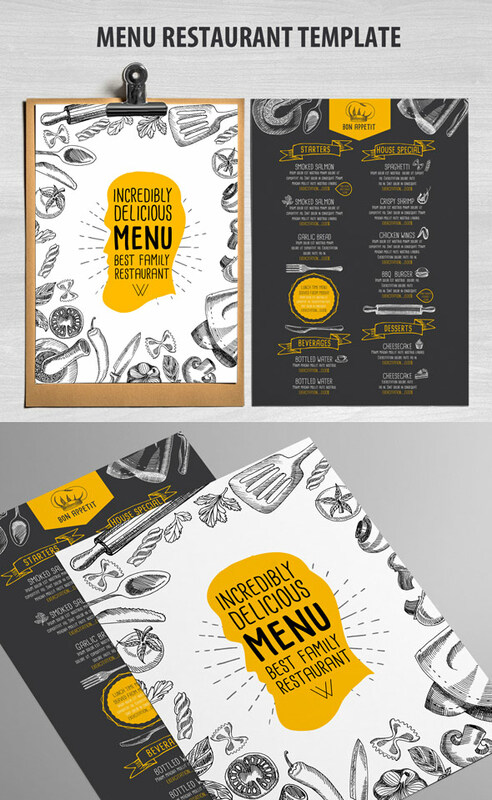 Best Restaurant Menu Templates, available for sale on Envato Market (GraphicRiver). choose as well. Browse through the inspiring designs below. 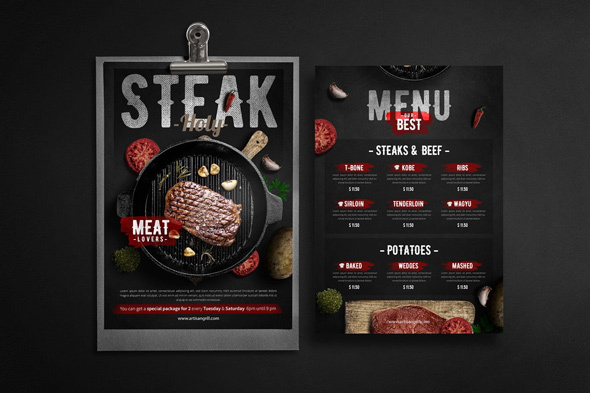 Here are 27 restaurant menu templates with beautiful designs and pro features. They pack in a number of print-ready, flexible design options. This modern, clean and visually appealing menu template is good for restaurants of all shapes and cuisines. Its minimalist, column-friendly design makes it easy for your diners to quickly and easily pick out the selections from your menu offerings. Use this for small restaurants of all types, from steak houses and bars to cafes and diners. It features fully-layered and organized files that take the hassle out of menu layout, so you can rest easy that you’re showcasing your best dishes to your customers. Enjoy the fresh, ocean breeze from your table with this delightful seafood menu. This template features stunning black and white vector illustrations for a classic, artistic feel. 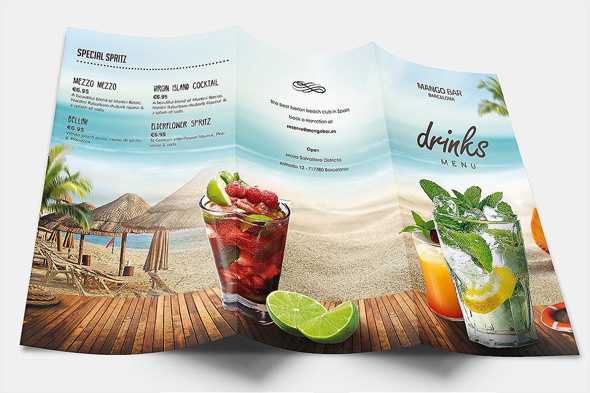 Great for seaside restaurants with that trendy flair, this template comes with Photoshop and Illustrator files in a convenient CMYK format. Easily insert your menu using the fully editable text holders. Stop your customers dead in their tracks with this delicious steak house menu. This template features print ready Photoshop files waiting for your customization. Insert stunning HD photos to make the most out of this gorgeous design. Curious about these fonts? Get information on where to find the fonts, Bernier and Lobster also included in this download. 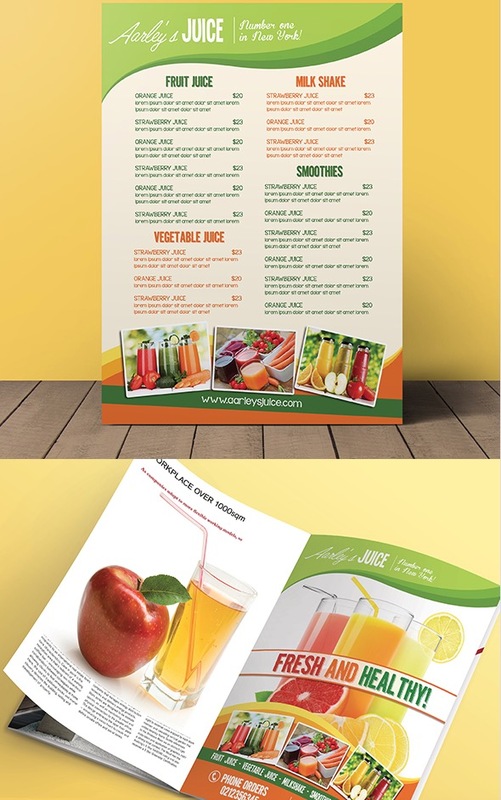 This sharp, modern and sleek menu design is perfect for multipurpose restaurant use. It features a minimalist, black-and-white layout and pleasing tracking between letters, so the type is readable and legible to your diners. Easily highlight your small restaurant’s most sumptuous dishes with its clean layout and thoughtful design. With Photoshop PSD files included and changeable images for greater customizability, this template is letter size for added convenience. Kick off your next restaurant with this gorgeous rustic design. 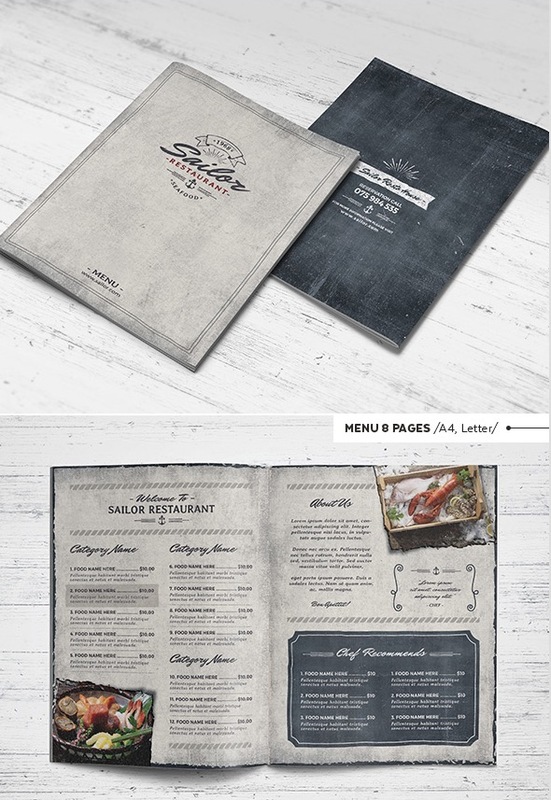 This menu template features an awesome retro design with grunge elements and elegant colors. Make the most out of this print ready template by customizing the colors and style to fit your brand! Download this file today and enjoy the free fonts also included! Featuring a soothing color scheme that’s easy on the eyes and color contrast to make important menu items stand out with clarity, this flyer is a steal, as far as menu templates go. 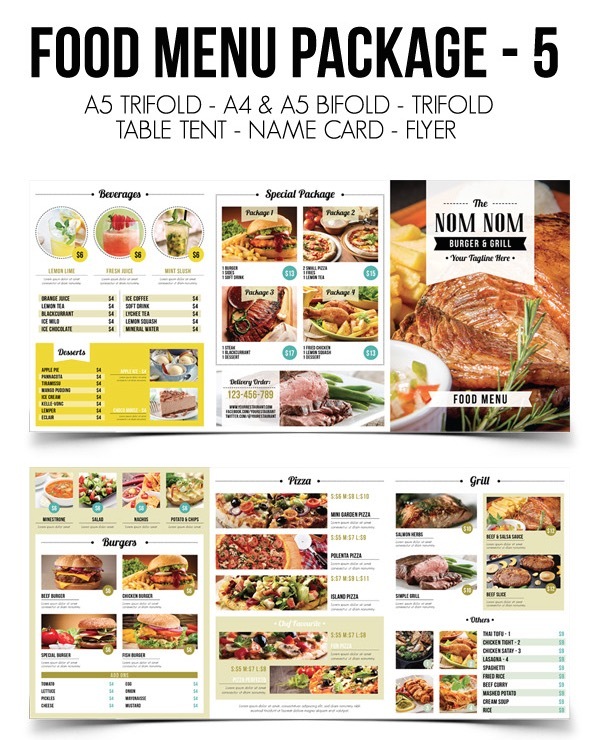 Whether it’s the chunked arrangement of content or its unique typeface, this menu design is suitable for small restaurant operators of cafes, steakhouses and even fast food eateries. Its graphic files come in both letter and A4 size for extra marketing flexibility. If full menu customization is what you’re after, then this template can’t be beat. It features complete control over its color palette, objects, images, text and content, making it easy for you to showcase your top-selling menu items! 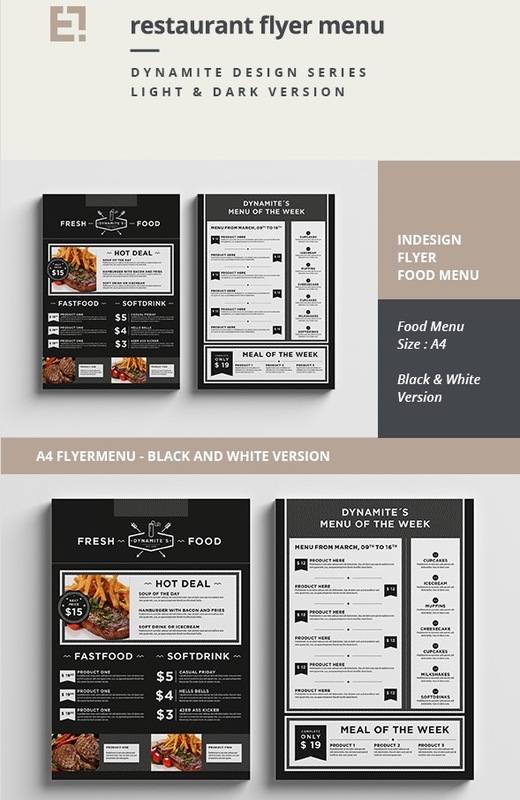 Print-ready and fully layered, this multipurpose menu template is good for whatever small restaurant type you’re operating. It comes with JPG image and Photoshop PSD graphic files. features cool dark wood elements for that trendy, sophisticated vibe. 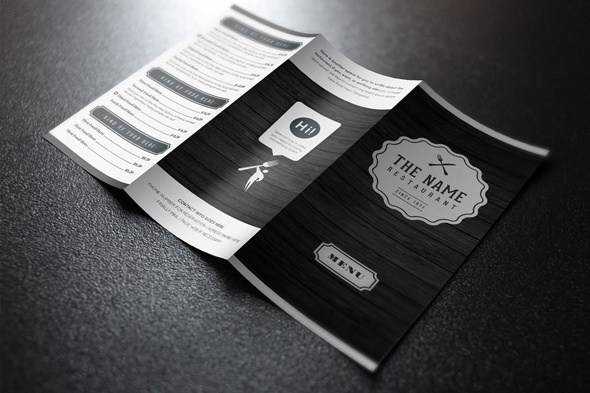 included in this template are menu essentials for a cohesive brand. 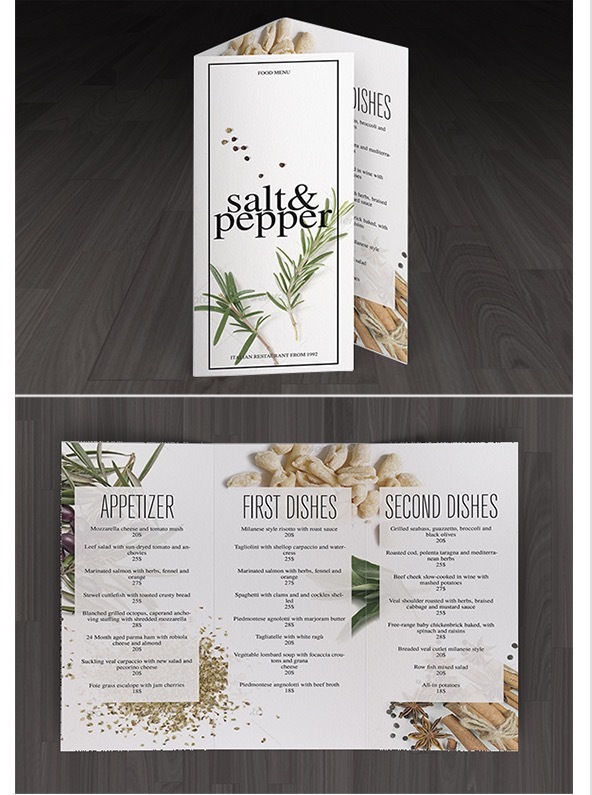 Customize this easy to use trifold for an elegant menu design. Invite your friends and associates to dine at your fine establishment with this chic and sophisticated restaurant menu. The modern design features your food front and center, balanced with tantalizing menu items from your restaurant. Customize this template easily in Adobe Photoshop for a fast upgrade to your menu. Enjoy print ready files that are well organized and ready to go! With a simple, yet attention-grabbing restaurant menu design, this offering showcases your small restaurant’s dishes in an easy-to-read format. This makes it ideal for people of all ages, including young children, the elderly and everyone in between. The stark color contrast is enough to push your best-selling items to the forefront, allowing hungry diners to pick them with ease. The template is perfect for a restaurant, pub, bar or café. Enjoy the fun of nostalgic design with this retro food menu. This design features a vibrant orange and black theme with bold, vector elements. Obtain this file to get access to a brilliant front and back design with fully organized layers and convenient bleed lines. Get started on your dream! 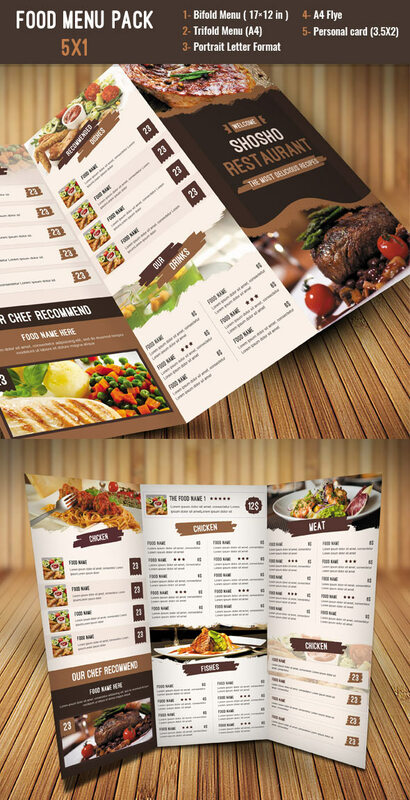 Download this grill menu template today! Small restaurant owners are always on the hunt for menu designs that are simple and attractive—conveying info clearly and persuasively. 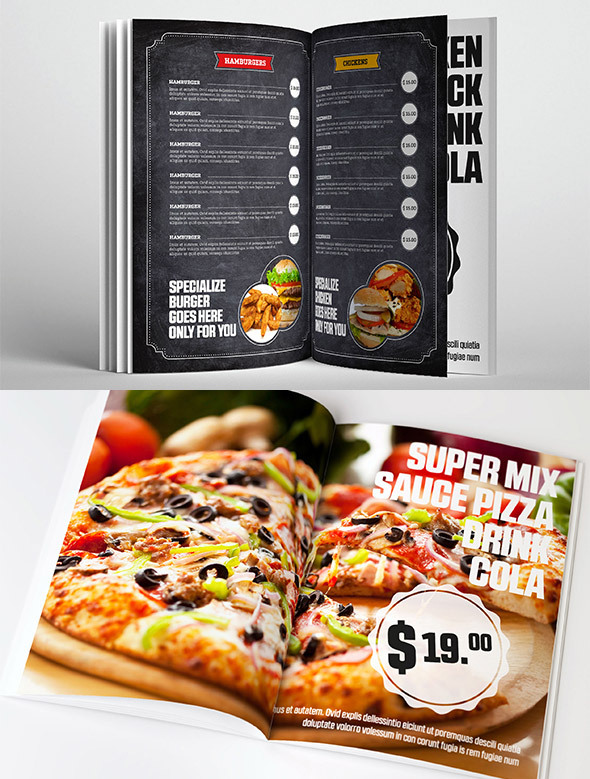 This food menu template has appeal to restaurant owners of all types, as it features a multipurpose creative design. If you’re looking to sell more of your signature dishes than ever before, this template is a great choice, as it showcases your biggest sellers front and center. 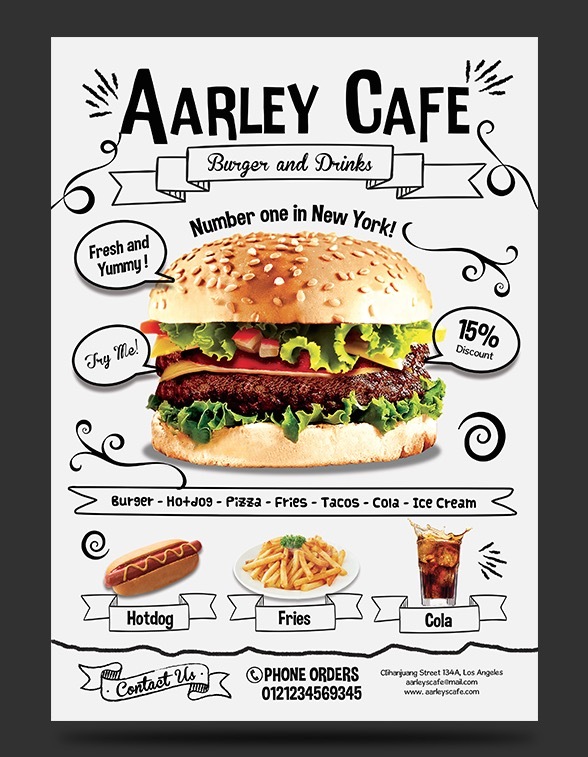 Clean design, big fonts and an attractive presentation are all at home in this restaurant menu design. Make your most mouth-watering dishes easy to spot by hungry diners with the template’s clear-cut, easy-to-read typefaces and excellent color choices. Don’t let the name fool you: It can swiftly be transformed into a menu for restaurants, cafes and steakhouses. Print-ready, this menu is compatible with Adobe CS4 or greater. Celebrate the sunny energy of summertime with this vibrant menu! This template features a brilliant tropical theme that all your customers will love. Get access to a duo of Photoshop and Illustrator formats for high resolution, print ready files. Need this menu fast? A handy help file is also included for further instruction. Bursting with a multitude of colors and vibrancy, this fantastic menu template offers complete customizability. Have a restaurant for which you want to design a menu? This is a great choice because it comes in letter and A4 sizes; features editable text; and images that you can swap in and out. 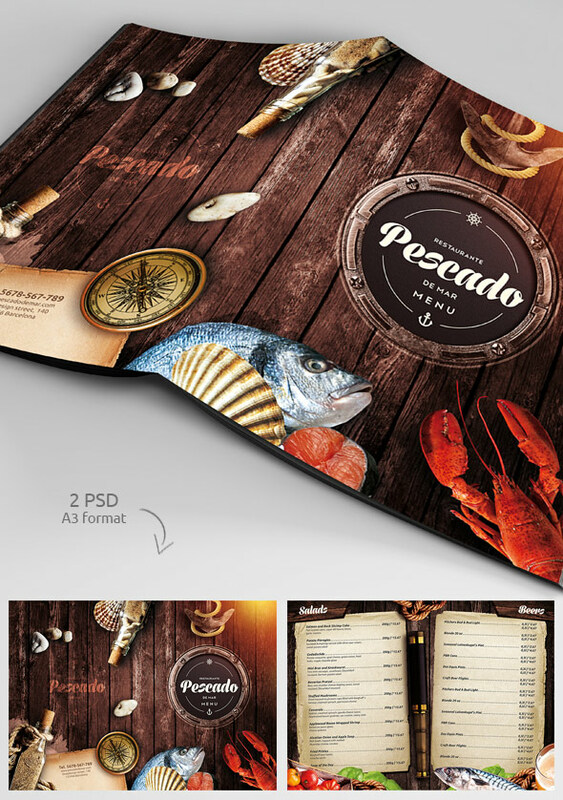 In short, it’s a restaurant menu design that’ll help you sell more dishes and encourage greater word-of-mouth attention. This crisp and presentable menu template comes with a neutral, solid-colored background and black fonts to help you make your signature dishes pop right off the page. 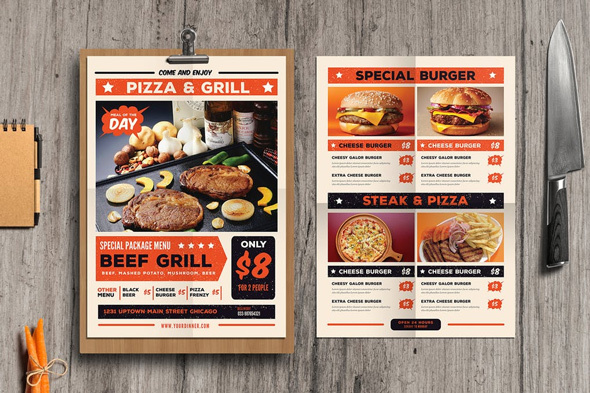 With included Photoshop PSD graphic files, this design organizes your small restaurant’s offerings into well-ordered rows and columns for quick comprehension. A minimum of Adobe CS6 is required for editing. This interesting take on menu templates features solid-colored, neutral backgrounds and loud, bold colors displaying your food graphics and images. 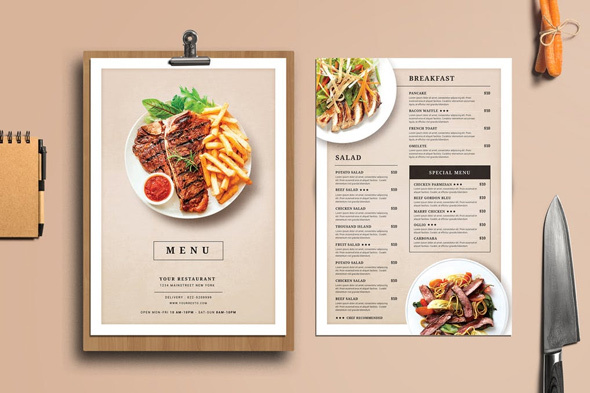 The result is a clean, well-organized menu design that enables your small restaurant to showcase its best dishes to hungry customers whenever they’re in your eatery. The text is customizable, so you can adjust it to fit whatever restaurant you’re running. It comes with Photoshop PSD and Vector EPS graphic files. A versatile restaurant menu design, this template is perfect for any small restaurant serving burgers, vegetarian, sushi and everything in between! With a clean, crisp and vibrant design, it’s perfect for drawing the eyes of your diners to the most sumptuous dishes on your menu. Large-size and bold fonts help diners’ reading experience. All told, you get a menu template that’s print-ready and offers five, unique layouts from which to choose. 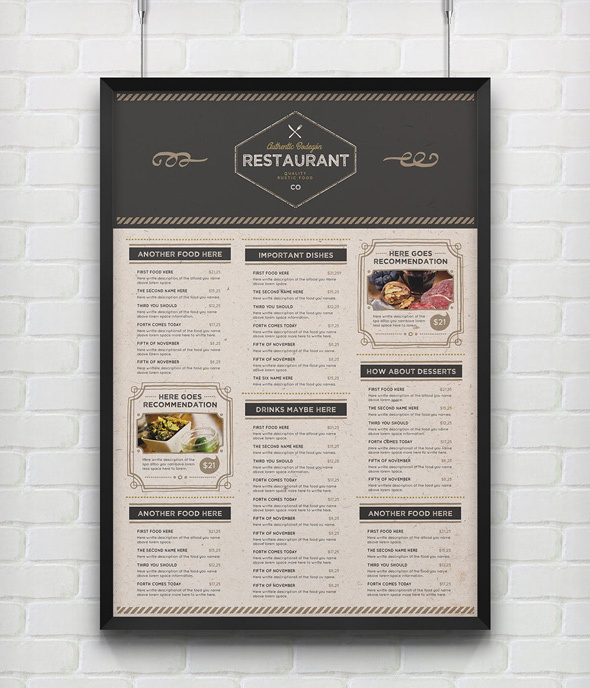 Hook your diners’ attention and appetites with this well-designed and neat restaurant menu design. Good for creating buzz and encouraging your diners to spread positive word of mouth, this template is great for multi-purpose use. 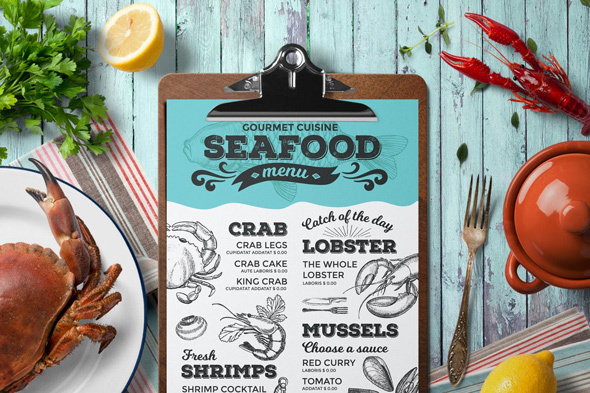 Whether you’re a bar, restaurant, grill or a catering company, you’ll succeed at highlighting your signature dishes and making your diners’ mouths water with this user-friendly template. It features Photoshop PSD graphic files and full-customization with easily editable text and images. The copious amount of white space in the design of this menu makes it very helpful in directing your diners’ eyes to the mouth-watering menu items your small restaurant offers. This template features 3D elements like shading, which is a useful, graphic-design element that makes the images of your food seem to pop right out to your diners. There’s also a business card template bundled together as a bonus. Minimalism is in full force with this restaurant menu template. Your diners will enjoy a Spartan design that’s broken up with bits of color splashes and images to highlight the ingredients used in your dishes. Typography-wise, this template features clean, big and easy-to-read fonts in the headlines that help diners make their selections. InDesign INDD and Photoshop PSD graphic files are included, and complementary business cards are part of this template bundle as well! 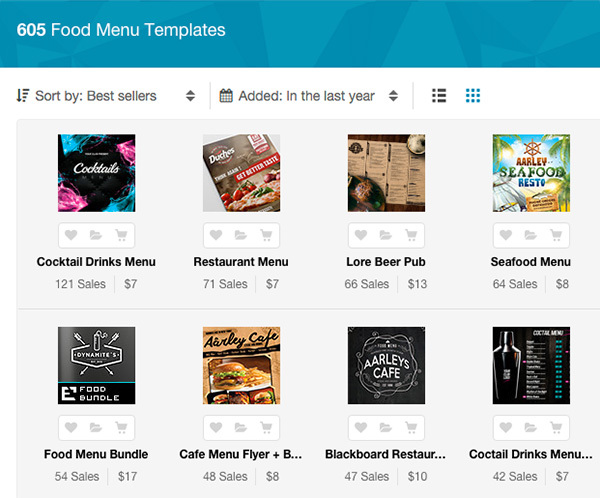 Small restaurant owners will love this package of menu templates that promises full customizability. You can easily and quickly change the logo, text and images to gain complete control over your menu design and messaging. The menu’s layout—with its card-based sections—is perfect for showing off the signature dishes at your establishment. This clean, modern template is suitable for all sorts of restaurants: cafes, diners, steakhouses and more! 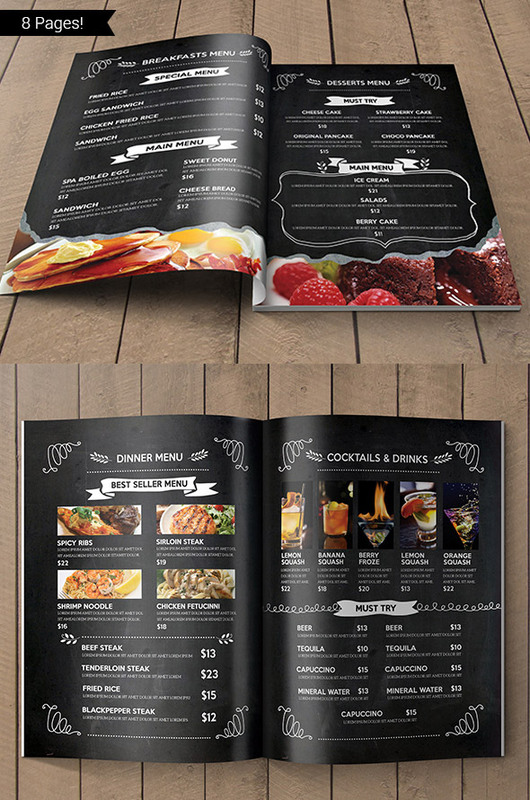 Create drama and atmosphere for your diners with this menu template that features contrasting light and dark dynamics. This modern and attractive layout offers alternating black and gray solid backgrounds that provide a stable backdrop on which to showcase your small restaurant’s dishes. With big headlines and a dual-column design, this menu makes it a cinch to highlight dishes you want to sell more of. It comes in A4 size and is print-ready. 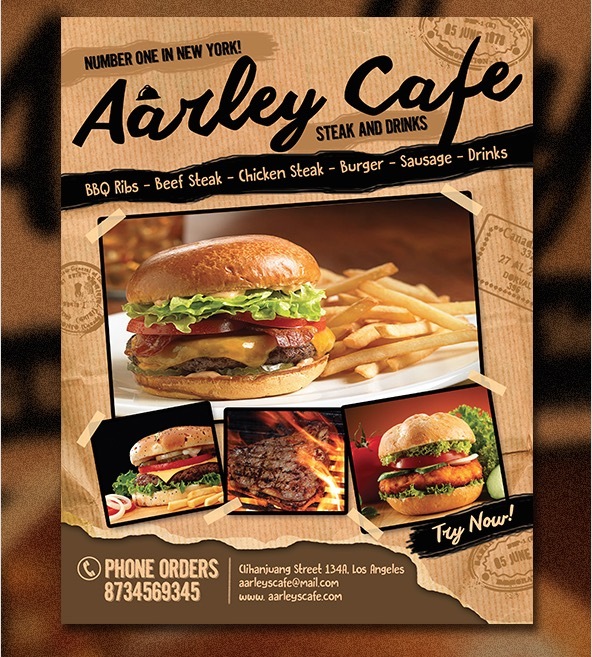 You can readily add your restaurants custom information and get this menu printed quickly! 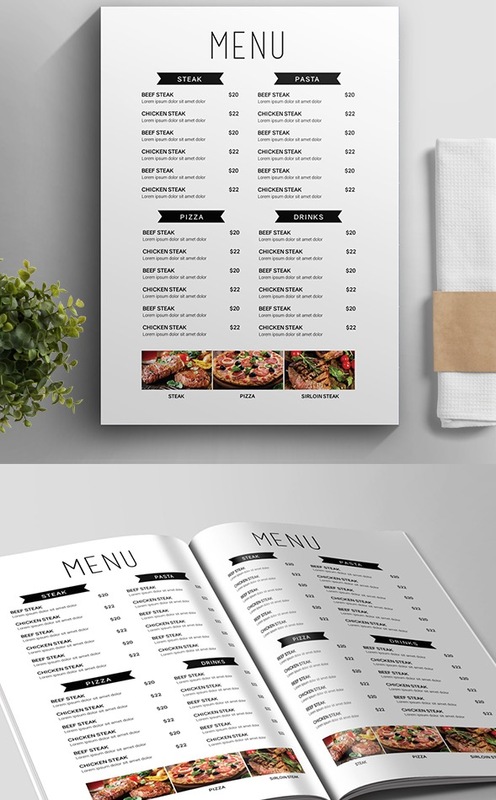 If your small restaurant has a significant number of dishes to display, then this restaurant menu design is ideal for your purpose. Featuring a trifold and bi-mold menu layout, this pack comes with Photoshop PSD graphic files included. Its evenly spaced page elements and large, readable titles and headings ensure that your patrons will quickly spot what they want to order on your menu. Full customization ensures you’re in control of your menu messaging. Minimalism is the overarching theme on this restaurant menu template, which means a super-simple and elegant approach to design and information presentation. With beautiful and copious padding and white space, it focuses your diners’ eyes on your signature dishes and menu choices. The clean, intelligent spacing ensures that people will spot what they want to order in a cinch. Multipurpose design means usage for restaurants, cafes, fast food places, and more! Huge, beautiful images are at the core of this lovely menu template. Draw the eyes of your diners to your most popular dishes and impress them at the same time with the high-quality images you can sprinkle throughout this template. 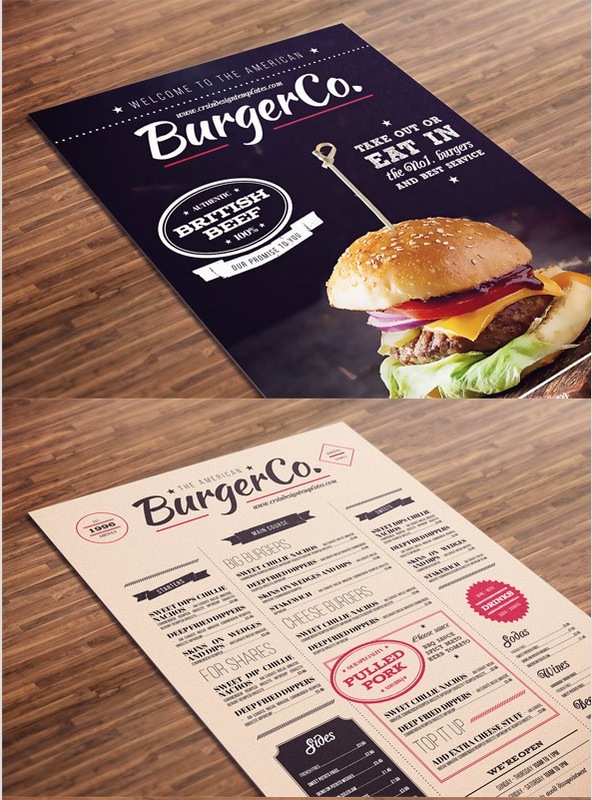 Whether you have a small restaurant, burger joint, sushi place or café to operate, this template will showcase your food in a favorable way! Full customization is ensured, as you can change both text and images at will. This menu template pack comes with both bi-fold and trifold menu layouts and business card templates as a bonus. Featuring a black-and-gray design, this menu is a study in minimalism and aesthetics. Effectively using contrast to make reading easier and more powerful, its typeface is large enough to make an impression with your diners. Text, colors and fonts are all at your disposal with full customizability! menu, much like reading a book. studies show that customers spend more without dollar signs in front of prices. Customize your menu and optimize it for sales and customer experience. 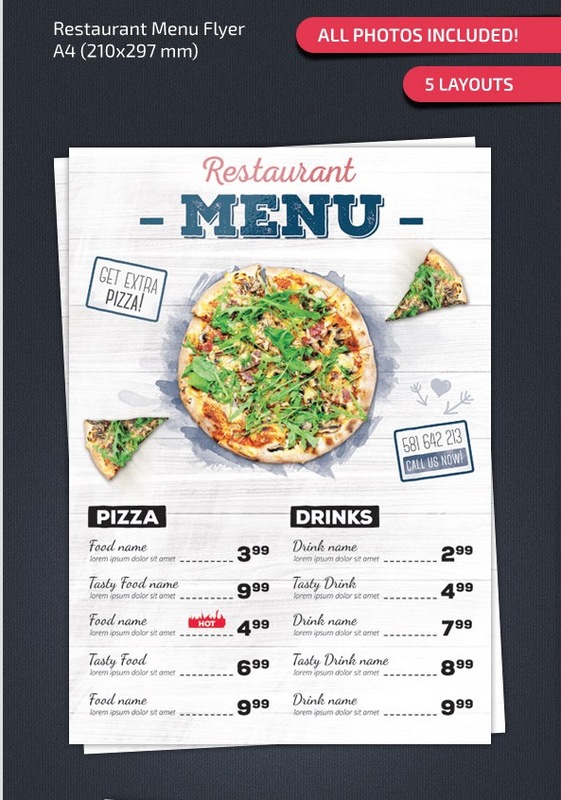 Get a Creative Menu Template Today! successfully sell its food to your hungry customers. 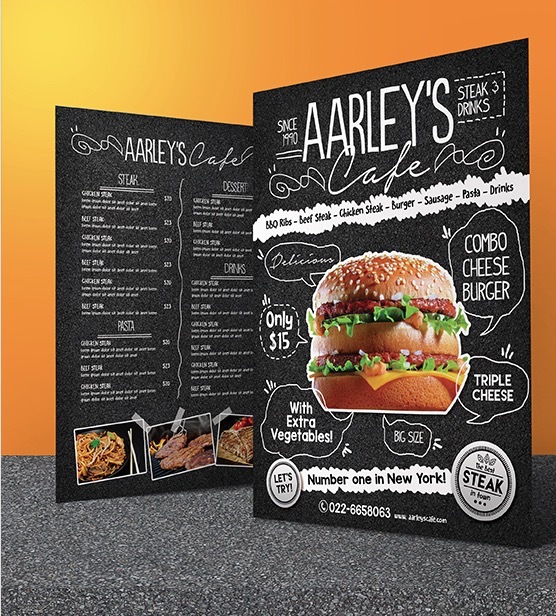 Take a look at our creative selection of designs and buy a template today to increase sales at your restaurant. 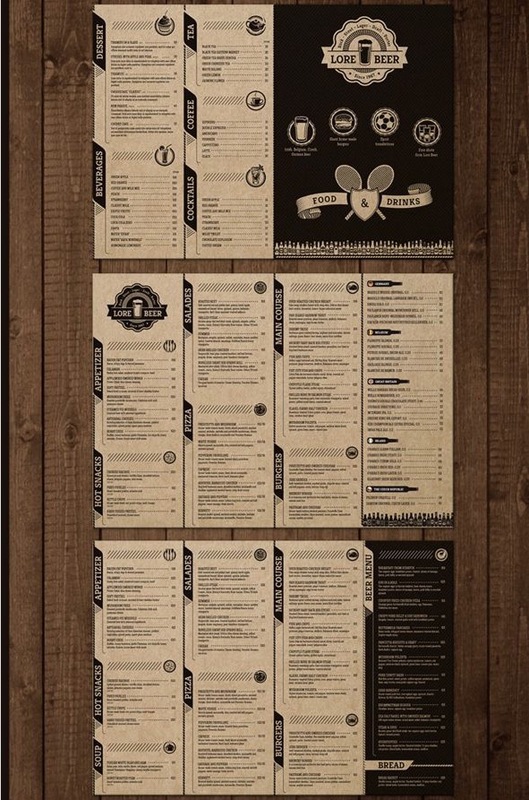 And if you’re a print designer or marketer, one of these templates may be just the right fit for your next small-restaurant client project.